Starting with Glam Glow. I bought a mini pot of the Hydrating Mask a few weeks back and have become absolutely obsessed with it, a whole review on that is on it's way. When I was in Boots picking up some bits I got myself some samples of the Exfoliating mask and I am so head over heels in love with the results from this mask. I'm definitely going to have to purchase the full size as a little treat to myself for Christmas. A red lip is my go to in December, I mean theres noting more festive. I've been wearing the Kate Moss Retro Red #53 literally everyday, its the absolute perfect berry toned red and I just cannot get enough of it. Just like other lipsticks from Rimmel it's really buttery and applies fully pigmented in one application, I wouldn't expect anything less from Rimmel! Although I will admit after living in Kylie Cosmetics liquid lipsticks the past few months I'm still getting used to the fact that I actually have to re-apply this and it does fade. 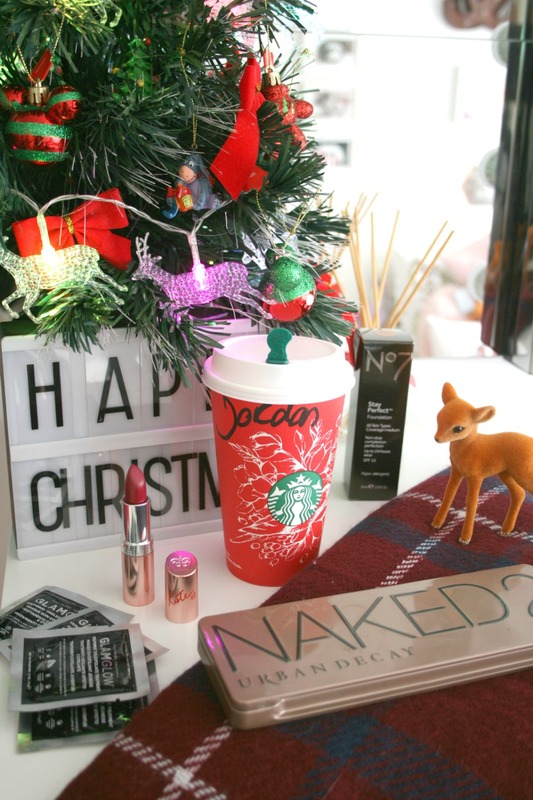 Although I do have a festive red liquid lipstick on it's way from Kylie Cosmetics but thats a whole other post! Let's take a little short break from Beauty items and lets talk about Starbucks. Firstly the ever so famous red cups are back and more adorable than ever, I'm literally so obsessed with the little designs on the cups. However I've been buying so many drinks from them just to get the darn cup design with the deer and I've still yet to get it!! While I don't drink Coffee I have been enjoying their Fudge Hot Chocolate's every now and then...Well to be honest I've lost count on how many I've consumed since they released them. But it's Christmas okay, there is no such thing as too many Hot Chocolates...amiright!? Back to makeup bits, I've rediscovered my Naked 2 palette and I am loving it again. I take moments with the Naked palettes where I will totally ignore their existence through the year and then once Winter hits they're the only things I use. I just absolutely adore all the neutral shades but also love that there are some glitter options to brighten up a look too! I have briefly used the Naked palette aswell but I keep going back to the Naked 2 just because I'm loving the shades more. Finally my foundation pick has not changed since the Summer. The No7 Stay Perfect foundation is my go to I just adore it. My skin is dry and in certain areas there are some dry patches and this is the only foundation I find that will not stick to them at all and leaves my skin looking flawless. I just bloomin love it and god only knows how many bottles I've gone through since May but I just cannot part from this one yet. What are your December Go To's?